Today we’ll continue our Living Legends segment with a player that is loved by few, hated by many, but a player that all can agree is incredibly talented. Today we look at the Pittsburgh Penguins’ Sidney Crosby. 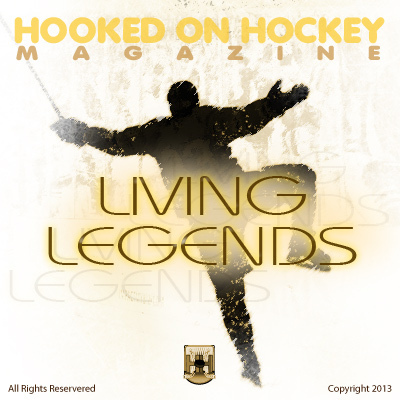 Since the age of 7, Crosby has been garnering significant media attention. Entering the NHL draft in 2005, you heard comparisons to Wayne Gretzky, Mario Lemieux, and Steve Yzerman. We all knew he could play. But even Crosby has exceeded our expectations, having already amassed 609 points entering the 2012-2013 season. What makes him so special? We all know he can pass, some of us have heard about his backhand, but I want to delve into some of the more technical skills he possesses. The first skill of Crosby’s that I want to look at is the way he uses his feet. Most NHL players will use their feet for basic things such as blocking shots or even kicking the puck up to their stick. However most players can’t do this at half-speed, let alone full-seed. Crosby has become extremely good at using his skates to deflect the puck to teammates as he’s skating through the neutral zone at full speed. He also is phenomenal at kicking the puck up to his stick at full speed while coming through the neutral zone. This allows him to make plays that most defensemen think are not possible. Generally, when a forward is coming through the neutral zone and the pass goes into their feet, most defensemen will step up and play the body, trying to take away time and space from the forward. However, Crosby has become so adept at kicking the puck and deflecting it, that when the defender steps up, Crosby is already moving past them with the puck on his stick. Watch below for an example of how he uses his skates so well to get possession of the puck at full speed. Another “skill” of Crosby’s is his faceoff percentage. Early in his career, his faceoff percentage was pretty mediocre. His first season was a measly 45.5%. His second season saw him still finish below 50%. Now? Crosby is one of the best faceoff men in the league, owning a 57.6% winning percentage this season. What’s changed? I think experience has been a major factor for Crosby’s development. As he’s taken more and more faceoffs, he has learned certain tricks and “tells” that different players have that indicate where that player plans to win the draw back to. Below, I’m going to show you a couple of textbook faceoff wins from Sidney Crosby and show just how cunning he has become. Watch this faceoff very carefully. First take note on how Crosby flips his hand over on the stick, indicating that he plans on winning the draw back behind him. Then, notice how when the new Phoenix Coyotes‘ player steps in, that player slides his hand low on his stick and flips his hand over, indicating that he too wants to win the draw back behind him. Crosby senses this and decides that he will “allow” the Coyotes player to win the draw and that Crosby will jump to where that puck is going. Crosby grabs the puck, dishes it to Evgeni Malkin, and bang, the Penguins have a goal. Watch Crosby and former teammates Max Talbot practice faceoffs on an imaginary puck. Watch how in one motion, Crosby takes his stick, knocks Talbot’s stick into the air, and then sweeps the puck back behind him. All of these tricks have allowed Crosby to become one of the top faceoff men in the league. This is such an important skill because that will allow Crosby’s line to start with the puck. Considering the fact that most forwards only spend 30-45 seconds on the ice at a time, it’s critical that you start with the puck. 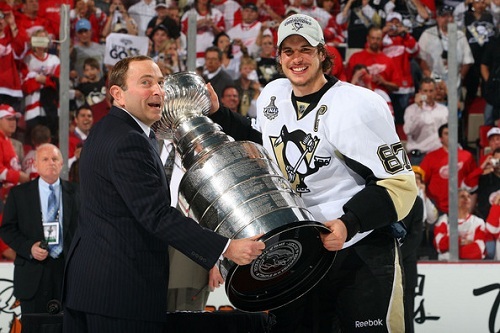 NHL Commissioner Gary Bettman presenting the Stanley Cup to Pittsburgh Penguins captain Sidney Crosby in the 2008-2009 Stanley Cup Finals. Another major skill I want to highlight of Crosby’s is his nose for the net. You’ll often hear commentators talk about how “the puck just seems to follow a player”. Crosby is one of those players where the puck seems to follow him. However, that logic is a bit shaky. It’s not that the puck follows Crosby – it’s that Crosby knows where that puck is going to be and positions himself in the appropriate spot. Where does Crosby score most of his goals from? They aren’t on wristshots from 40 feet out. They aren’t on one-timers from the slot. They are on rebounds, deflections, or loose pucks that end up near the front of the net. As I’m writing this, I’ve just returned from the Carolina Hurricanes-Pittsburgh Penguins game. This is now the third time that I’ve seen Crosby live and each time he seems to get better and better at knowing the exact moment to head towards the front of the net. Watch this goal. At the 5 second mark, Crosby is in the corner surrounded by 4 different Washington Capitals. In the next two seconds, Crosby darts behind the defense and makes a beeline to the front of the net, eluding the unsuspecting John Carlson. He beats Carlson to the front of the net and bats the puck into the net out of mid-air. This goal is pure instincts. There are several things to pay attention to. First, the defenseman at the top part of your picture, when he dives down to the faceoff dot, that causes the defenseman at the right point to shift to the left point. At this point in time, Malkin decides to drive behind the net and trade places with Crosby. Nine times out of ten, the normal hockey player in Crosby’s position will drop back to the right point to cover for the rotating defenseman. However, Crosby reads the play and instead darts to the front of the net as Malkin is passing it to James Neal in front of the net. Crosby cuts behind Neal and positions himself right in front of Ottawa Senators netminder Craig Anderson. He receives a pass from the pinching defenseman and has an open net to deposit the puck. This is Crosby’s hat trick from the 2009 Eastern Conference Semifinals. Every single one of the goals is scored within 10 feet of the goal. Watch on both the first goal and the second goal how Crosby gets position on Mike Green in front of the net to score off of rebounds. He uses the space behind the net so well to get “lost” by the defense and then he’ll come around the other side and sneak to the front of the net. One of the many brilliant strategies Crosby employs to shake the defense. The last skill I want to talk about for Crosby is his incredible ability to protect the puck. Crosby is listed at just 5’11” 200 lbs. He does not have the luxury of natural size that former Penguins Mario Lemieux (6’6″) and Jaromir Jagr (6’4″) had. However, many opposing defenseman will tell you that Crosby is one of the most solidly built players in the NHL. His ability to swivel his hips as he is receiving contact allows him to absorb contact and maintain control of the puck. Below are just a few of the plays he’s made by using his body to shield the puck. Watch Crosby lower his center of gravity to protect the puck as he skates into the neutral zone. The ability to lower his shoulder and carry the puck with one hand and then all of a sudden get his other hand on his stick and roof a backhand is just sick. Watch Crosby just protect this puck all day against the Ottawa defense before finally getting the puck to the point for a shot from Letang. Just incredible protection of the puck. Watch Crosby swivel his hips just as he feels the contact coming from the Calgary Flames defenseman. That makes it virtually impossible to strip the puck from him. He then stops on a dime and cuts across the front of the net and deposits the puck in the goal. There are very few people in the history of the game that possess that kind of ability. This one is pretty similar to the one against Ottawa. Crosby uses the space behind the net and his off arm to keep the defenseman away from him long enough for him to find a play to make. Yes there are people that complain about Sidney’s whining and his diving and things of that nature but you’d have to live in absolute denial if you felt that he was anything less than one of the two or three best players in the NHL right now. He has an incredible ability to protect the puck, a knack for knowing where the puck is going, and he knows how to finish the plays once he gets there. He does everything offensively at a very high level and his defense is still coming along and is more than acceptable. He’s definitely one of the best players of our generation and will be a Hall of Famer when his career is up.